Free download AquaSnap latest version. Download AquaSnap new version from high speed direct download link. 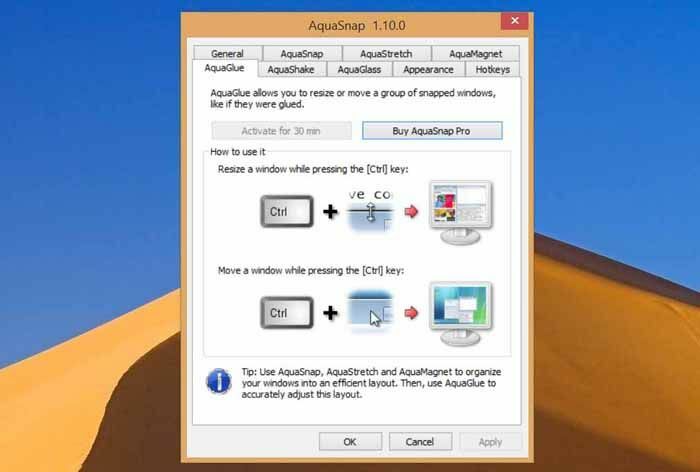 AquaSnap is a freeware that allows you to resize and move the windows exactly you want. Moreover, after resizing any window, the pixel and quality will remain same as original. You can say that AquaSnap is the dream software for you to enhances the way for which you want to arrange windows on your computer desktop. If you want to fit your window with the side of your desktop then just drag and drop it. It will automatically resized to fit as half or quarter of the screen. It has the same functionality as built-in function of Windows OS Aero Snap but this program has more possibilities. AquaSnap also allows you to work your window like a magnet for your desktop sides. When you will move any program window toward already opened window, it will stick with it. You can also maximize your window to free space of your desktop. You can do this by Double-click from mouse at the edge of the window. This will extend the window size into one direction and if you use shift button, it will maximize as vertically or horizontally. You will see another magic with adjacent windows of different programs. If you resize the window of one program by pressing “Ctrl” button, the other program window (that is adjacent with it) will automatically resize accordingly and it still remain adjacent. If you are working on a full screen program and want another on top without disturbing your work, then it’s good for you. Just pick and shake the other window, it will not only become transparent but also remain on top. You can put it in normal state by shaking it again. Watch the video of Magic….